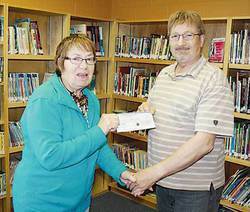 Bob Maynard (on right) Vice-Chair of the Millet Library gratefully received a $500.00 cheque from a representative of the Sons Of Norway. The Sons of Norway are a very active community group that raises funds to help support many different organizations in the area. Photo graciously submitted by the Millet Public Library.